Need to replace wood, steel or aluminum with a strong, lightweight, long-lasting option? We stock one of the industry’s most comprehensive lines of FRP profiles. Fiberglass angle, beams, rod and more are in stock, and same day shipping is available. Our fiberglass reinforced plastic structural shapes are just as strong as traditional building materials, but have a longer life cycle and are backed by our 25 year warranty. Add in benefits like weather-resistance, optional safety features, multiple color options, and nationwide inventory and it’s hard to say no. Count on Bedford for everything from skilled design and engineering services to fabrication, assembly and timely delivery. Bedford has a state-of-the-art fabrication facility with CNC machines for faster processing. Kitted shipments are also available to save installation time on site. Don't See the Profile You Need? Need a different color? Specific tolerance? Unusual reinforcement sequence? No problem! 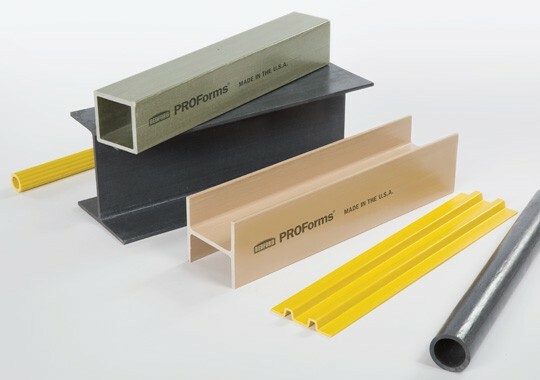 We can create custom FRP profiles for your specific application. The possibilities are virtually endless, and volume pricing is also available. Just contact us for a quote or assistance with engineering a solution to fit your project.